My first roommate, besides my brother, was a pimply kid from Baltimore. I got assigned to him randomly when I went away to boarding school. I was fifteen. He was into computers. In fact, he had somehow built his own computer. This was in 1983, so he was ahead of the curve on that one. He didn’t have any posters but covered his walls with random things from his life. I never looked too closely, but I remember a broken calculator as being one of the things hanging on his wall. There were papers, notes, drawings, scraps from magazines. He was a smart kid, a dweeb. He played Dungeons and Dragons. Like many of the dweebs, he was simultaneously awkward and arrogant, and he had a weird but OK-looking girlfriend. We got along pretty well. He drank a Coke before going to sleep every night, claiming that it always knocked him out. He was the only Jethro Tull fan I’ve ever known. He was a rich kid, I guess. I’ve always figured that he went on to make a lot of money in computers. His mother dated Jim Palmer for a while and he and Jim Palmer once played racquetball. Jim Palmer reached the major leagues at age 19 and capped his first full major league season the following year by ruining Sandy Koufax’s final game, beating Koufax 6-0 in Game 2 of the 1966 World Series. Palmer had not yet turned 21. He spent most of the next two years injured or in the minors, the Orioles not able to contend without him, and when he came back to stay in 1969 the Orioles won three straight American League pennants. So in Palmer’s first four full seasons in the majors, his team won four American League pennants and two World Series titles. Though things slowed down a little after that, he still was able to add four more division titles, two more pennants, and one more World Series ring to a trophy case that also included three Cy Young awards. In addition, he racked up more wins in the 1970s than any other pitcher. I’m tired, timid, empty. It took me a long time to get out of bed. Unwrap each day like a precious gift, I thought to myself as I lay there under the blankets, unable to move. I guess later I’ll go buy a paper and scrutinize the NCAA basketball bracket. So far today I’ve written in my notebook, listened to sports radio, eaten some saltines, and tried to figure out which World Series game included the most Hall of Famers. I started investigating the subject after seeing that Jim Palmer won a game in relief against the Philadelphia Phillies in the 1983 World Series. The losing pitcher, Steve Carlton, is a Hall of Famer, as are three of his Phillies teammates (Joe Morgan, Tony Perez, Mike Schmidt) and two of Palmer’s fellow Orioles (Cal Ripken and Eddie Murray). Since obvious Hall of Fame-caliber player Pete Rose also pinch-hit in that game for the Phillies, I gave the game a total score of 7* with the asterisk standing for Rose, and then started scanning through likely contenders on the baseball-reference.com postseason index. I eventually found a World Series game that featured nine Hall of Famers (plus an additional Hall of Famer if you count managers). I feel fairly confident that this is the record (author update: it’s not), but my search was inexhaustive and reliant on hunches, so please correct me if I’m wrong (author update: someone did; see comments). But let’s just say I’m right. Can you name the year and the teams and Hall of Famers involved? Finally, to end this lackadaisical meander of a post, let me again throw out the trivia question from a comment I attached the last post, copying it from the back of Bob Coluccio’s card (“Which pitcher sang National Anthem at ’73 World Series?”). Hint: the player once contributed to a World Series defeat of Jim Palmer’s Orioles and then later wrapped up his career as Palmer’s teammate. As far as nine HoFers–Oak vs. Cin in ’72 would’ve had a bunch. Those Phils above that had been on the BRMachine, plus Bench, plus Sparky as the HoF Mgr. And the A’s would’ve had Fingers and Reggie and Catfish. So we’re getting there. 2. 1 : Good guess, but my my count that series HOF player-count peaked in game 2 at six-plus-Rose: Hunter, who won, Fingers, who got a save, plus Perez, Morgan, Bench, Rose, and Reggie. 3. Check that: Reggie missed the WS that year. I had a hunch and game 4 of 1932 World Series Game had 12 HOF’s and 1 HOF Manager. Also, the Cubs had released Hornsby in August. 5. I forgot to add Dickey to the list of Yankees in that game. 7. A cool thing about that 1932 game is that of the three Hall of Fame pitchers involved, NONE of them started the game (Pennock and Grimes pitched in relief, and Red Ruffing pinch hit). 8. Based on the clues you gave for the Anthem Singer, I had a hunch. Went and looked it up to confirm that I was right. He was one of a handful of players I know of that shares my birthday, and I believe the only one who played for my hometown Orioles. 9. One more with 12 + 1 Mgr, but with an *. 2008 inductee Billy Southworth is in the HOF as a manager. This game featured 4 HOF pitchers. This is a very similar question, I have been trying to work out. Which movie has the most Oscar award winners (acting only). I can only find 1 so far with 5 actors – California Suite. 10. 9 : I checked some Jack Lemmon titles, figuring he’s probably been in some “deep” casts, and it looks like JFK had 5 Oscar-winners also: Tommy Lee Jones, Sissy Spacek, Lemmon, Walter Matthau, Joe Pesci. 11. 9 , 10 I count 6 in Gone With the Wind: Vivien Leigh, Clark Gable, Olivia de Havilland, Hattie McDaniel, Jane Darwell and Thomas Mitchell. 12. This one’s kind of a special case, that definitely needs an asterisk. Around the World in 80 Days had a zillion cameos stuck in here and there, and by the time they were done the cast included 7 Oscar winners: David Niven, John Gielgud, Ronald Colman, Shirley MacLaine, Frank Sinatra, Victor McLaglen and John Mills. It has been driving me nuts for a while. I also found On The Waterfront, Philadelphia and Poseidon Adventure with 5 a piece. I think JFK could get to 6, since Gary Oldman, Costner and D’Onfrio are still acting. Also if Antonio Banderas can get one, Philadelphia would have 6 also. I didn’t look yet, but excluding the past 20 years, which WS game had the fewest HOF. I am guessing the Browns WS during WW2. 14. Bad Day at Black Rock also has five. If you count screenwriting Oscars both Godfathers do also, with cameos by Sofia Coppola. 15. 14 If you want to expand the list to “Actors who have won Oscars in any category,” then Costner kicks JFK up to six. 16. 13 It’s exactly 20 years ago, but Games 2, 3, and 5 of the 1988 World Series featured zero players who are in the HOF or have a shot, unless you’re a big believer in the rehabilitation of Mark McGwire. 18. As long as we’re drifting in this direction, here’s a related bit of trivia: I know of only one movie that had its entire cast nominated for acting Oscars. Any guesses – and are there any others out there that I missed? 19. 18 : My hunch was Who’s Afraid of Virginia Woolf (critically acclaimed, small cast), and upon checking I see that all four credited cast members did get nominated (the two ladies won), but there are two uncredited cast members, both named Flanagan. Does that count? 20. 18: Give the Hell Harry! and Sleuth are two where the entire cast was nominated. Even though IMDB has listed other actors in Sleuth other than Michael Caine and Laurence Olivier. 21. The reverse of that is that John Cazale was in six feature films, and all of them were nominated for best picture. 22. 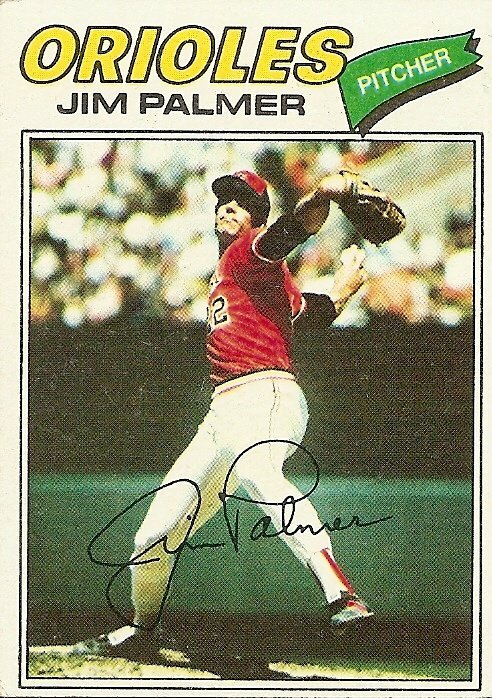 As I have mentioned before, my favorite AL team in the 1970s — and through to today — has always been the Orioles, and Jim Palmer was my second favorite pitcher behind Tom Seaver. Palmer appeared in THE NAKED GUN, which featured Oscar winner George Kennedy, Grammy winner Weird Al Yankovic, Emmy winners Ricardo Montalban and Nancy Marchand, and Razzie and Heisman winner O. J. Simpson. I was always disappointed that Palmer made that last gasp at baseball, trying to emerge from retirement after he already was in the Hall of Fame. 23. 21 : Cazale was great. I didn’t realize, or had forgotten, that he died so young. According to his bio on imdb his experience on the Deerhunter was a little like Bruce Pearson’s last season with the Mammoths in Bang the Drum Slowly–when the studio found out he was dying they wanted to remove him from the cast. The bio also says he was in “Line,” the Israel (father of Adam) Horowitz play about people standing on line that ran for a billion years in a basement theater on 12th or 13th Street in the village. My dad took us to see that play back in the ’70s, so I wonder if I saw him in it. 22 : Palmer’s comeback attempt was another thing I’d forgotten about until reading up on him a little recently. I understand the disappointment of seeing a guy like Palmer or Michael Jordan limping around like a desparate mortal, but I can’t ever fault a guy for wanting to give what he loves doing one more try. 24. 19 Yeah, I used to think Virginia Woolf qualified until I saw it again and realized there were two other people in it. Close, but not quite. 25. 23 Why is it standing or waiting “on line” some places and “in line” others? Out west it has been “in line” for as long as I can remember (and I’m 47). I always associated “on line” with New York. Perhaps in the old days, there was often a literal line on the ground? 26. 25 : Interesting question. I think I’ve always used both without really thinking about it. “In line” has the sense of lining up straight, like a group of kids on their way to gym class: “OK, everybody get in line.” There doesn’t have to be any waiting involved; you get in line and go. Nellie was quite an accomplished singer–and a great guy, too. Sad that he passed away so young. Good job, Bruce. Leave it to an expert. 30. Late to the party, and like “JFK,” this is probably a bit of a cheat, but the record for acting Oscar winners in a cast has to be “The Player.” Tim Robbins and Whoopi Goldberg have “real” parts, and the number of Oscar winners playing themselves is staggering: Susan Sarandon, Cher, Jack Lemmon, Rod Steiger, Julia Roberts, Marlee Matlin, Joel Grey, Angelica Huston, James Coburn, and Louise Fletcher, I believe. So that’s 12.